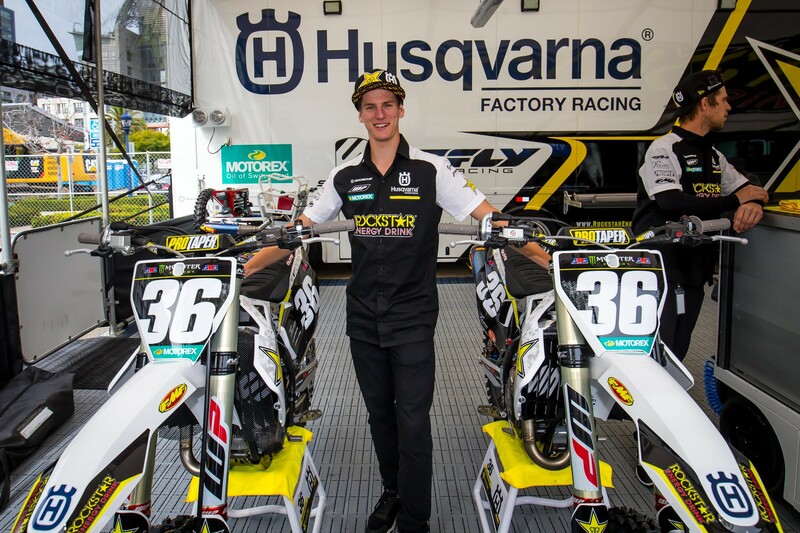 On the surface, Michael Mosiman is just another in a huge crop of young riders to graduate to the pro ranks with a factory ride (Rockstar Energy Husqvarna in his case). If you’re a hard-core fan, you can pick Mosiman, Sean Cantrell, Mitchell Falk, Jordan Bailey, and Garrett Marchbanks out of a lineup, but there are many that probably can’t. Well, as these riders ease into their pro careers, personality traits begin to seep out. 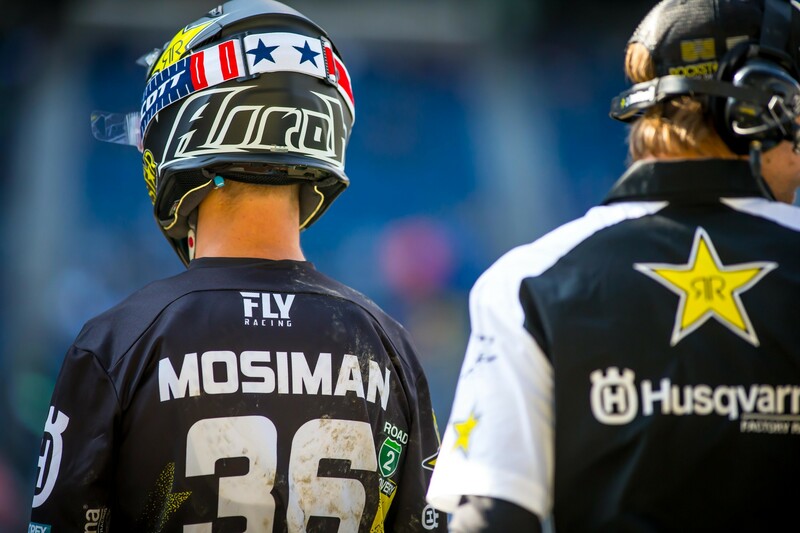 Mosiman is actually one of the funniest and most personable riders in the pits. He’s also getting better, evidenced by leading several laps in Denver and fighting hard with eventual race leader Adam Cianciarulo. He showed up to the post-race press conference and a unique interview quickly ensued. 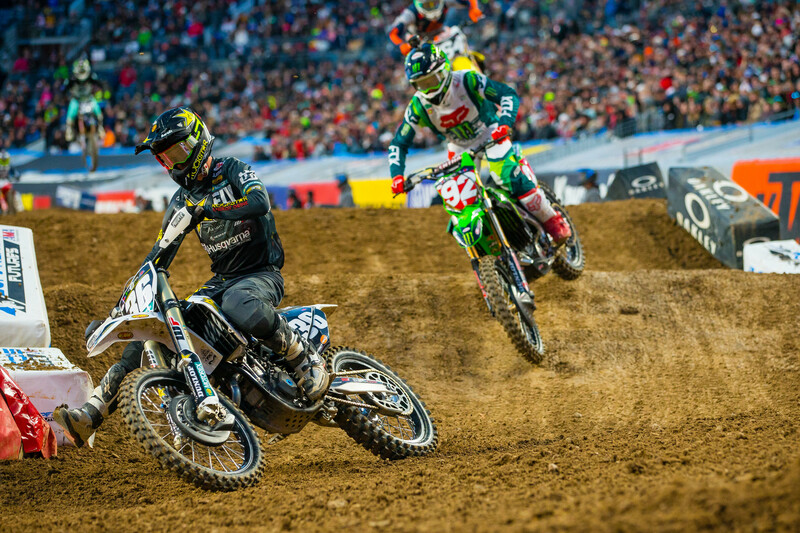 Racer X: Racing hard, fighting for every inch out there. We can get to the main in a second, but I even feel like in practice every transition, every little spot, all those little inches, you look like you’re really charging. Yeah, I really notice it. I think you’re, I can put a number on it, you’re 18 percent harder charging through every section than where you probably were at the beginning of the year. Oh, I was not good the beginning of the year, but…. Yeah, but not just results—I can see how much harder I feel like you’re pushing. Are you doing that? Well, here’s the thing: actually, I’m not. Even in practice, there’s some laps where I’m like, “All right, let me push. I want to get a fast lap.” You watch Dylan [Ferrandis] and [Adam] Cianciarulo and they just look like on the edge, freaking pinned. For me, I was like, “All right, push!” Then I make a small mistake, small mistake. I back it down and it’s like, that was your fastest time. That should have not been faster. That was slow. But it is actually faster. Okay, not what I expected then. So maybe I’m seeing times where you’re charging, but those aren’t actually your best laps? I don’t know. I am charging even when I’m cruising, obviously. Just trying to be consistent through the double, over-table, over-table. There I felt really good and comfortable and felt like that was a place that was a strong suit for me to make time up. You would see me push through there pretty good. Well, that’s where the press box was, so your entire night I’m determining by one section of track. Is that fair or unfair? I was going for it, but the mental state and how I feel is not going for it. It’s super strange. So in the moment you’re racing your own race? You’re not racing each corner? You’re thinking of an entire 20 minutes or 15 minutes? You want to know what I was thinking about? In the heat race, I got roosted pretty good, and I got some dirt in my goggles. So I talked to the guy and said, “I’m having this little issue. Can we fix this up?” “Yup, we got you.” So they put Vaseline in the bottom of my goggles. I go out and I holeshot and I’m like three laps in and I’m like, “Well, I fixed the dirt in the goggles issue, just get out front!” That’s what I was thinking about. I can tell you I was on the double before the triple, and that was going through my head. Pretty funny, huh? That is good. Or maybe not, I don’t know. Maybe you should be thinking about riding. Maybe. So, we’ll go sports psychology. So in sports psychology there’s this flow state, right? It was working, but it wasn’t like, “I got to get him back! I’m out of the lead!” You were just riding? Yeah. He looked over on me I think off the triple, and then I looked over at him and off the next triple I was like, “Yo, Jeremy McGrath, bro!” I was bummed he didn’t look over at me. It was so cool. Yeah, back in the day when dudes went over a triple they always looked at each other. It’s gone. To be honest, we’re just programmed not to do this. Look ahead! Look ahead! Let’s be honest. People don’t even do cool whips like they used to. Rick Johnson, like lap 12 he would start doing one-handers. Now they don’t even do one-handers at any point. I’m not kidding, dude. Eight laps to go, every jump. Whip, one-hander… Sometimes he would crash. He was a showman. Now you can barely get anything out of you guys on the finish line jump. So pick it up. Next time you’re leading a race, next time you’re way out front, lap 12 start doing some stuff. Anyway, so what Adam said he was working so hard to get by you that once he finally got by, he was like, “I’m going to take a deep breath over this triple and try to get my heart rate back down,” and then you were right back in front of him. That’s what he said. Yeah. Kind of funny. When he got by me, it was in the rhythm before the triple, I had a good line there. I kind of landed outside off that last double and cut across. So I kind of felt it all coming, I guess you could say, and just went back to the inside. It was available. It was cool that we could ride clean and hard and that he respects me for it. It’s cool. Those two 90-degree corners had passing, both corners before and after the triple. It was good. Crazy. It was so interesting. The track was “tough to pass,” and one-lined, yet we saw so much side-by-side racing, like crazy amounts. And it was a little bit easier track, per se. So I think that promotes that, so it’s good and bad. But then still, you find [Marvin] Musquin, [Cooper] Webb and [Eli] Tomac on the podium. You find Cianciarulo and Ferrandis. So, the cream rises to the top. At the end of the race the podium guys aren’t even close to each other. 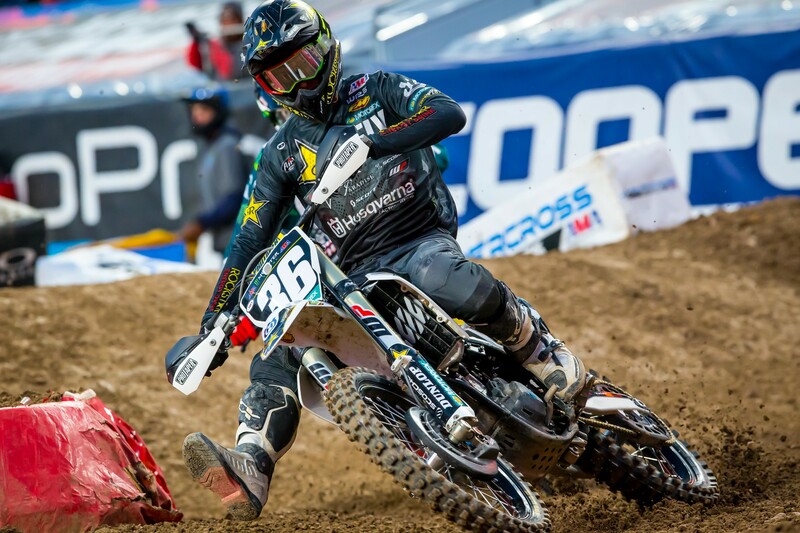 For you though, having that holeshot, are you bummed that you didn’t end up on the podium? Okay. I didn’t see how [Colt] Nichols got you or where that happened. Where did that happen? I don’t even remember. After the whoops, probably. I was struggling in the whoops. He would have probably got me there. You seriously don’t remember, or are you blocking it out? I’m pretty certain it was after the whoops. Then we saw you go down late. You got up and from a dead stop you triple-tripled. I was like, here we go! When I was behind Colt, two laps to go, I’m like, podium is in sight. You were still right there? Oh yeah. I was right there. There were some lappers going on. I was like, “I can do this.” So I go, “Okay, I’m going to step up the pace a little bit.” Boom. Hit the deck. But because of that or because of the rock? I don’t know. I’m thinking, honestly, rock and I was down. I felt like I did nothing to deserve that, however there may be a correlation between stepping up the pace and going down. But it might have just been the rock. Then in the last turn? I hate to keep bringing this up. It’s what happened. So, I get up right in front of [RJ] Hampshire. Triple-triple. I’m like, “I’ve got to go.” Then kind of get back in my flow, only got two laps to go. Last lap I got [Sean] Cantrell and [Robbie] Wageman in front of me and they’re battling for a position. They battled in the heat. Through the whoops they were going off each other. I got Hampshire behind me. I tripled to the outside to try to sort it out, figure it out, and it just didn’t work out for me. Hampshire went on the inside and that was pretty much all she wrote. It’s so tough when they’re battling and we’re battling. If there was no one there, I have to imagine I would have taken it. But props to RJ, charging on the last laps. I really respect him as a competitor. How’s your team feeling? It seems like these last couple races you’re riding better. Apparently not charging harder, necessarily, but riding better, going faster. How are they reacting? What are they saying? I think this is on cue for them. I don’t think this is unexpected for them. I say that because they’ve been telling me this is what I should be doing. Not in a pressure way, but in a “you need to believe in yourself” way. So it was good for them. They were stoked. Morale booster, for sure. It was just an all-in-all good night. They were excited to have a Husky guy lead. It’s really just good. Hopefully I’ll be back with them next year. We’ll see. Obviously, I’m currently on a one-year deal. Who knows what the future holds? I’m pumped. Outdoors, it’s been a tough transition just in practice, because I’ve been riding it at the Baker’s Factory. I’m like, Man, these 450 guys are fast. Oh my gosh. Musquin has been riding insane, like out of his mind. So, you guys all ride together when it’s outdoors? To rough it up, I guess? Oh, it gets rough. Then just to gauge. But this past Tuesday when we got rained out and couldn’t ride supercross, we rode outdoors. It felt like I kind of picked it up, so I’m excited. I’m really excited about my starts. I think that’s huge outdoors. So I feel like I kind of got some things going on. Is Hangtown a local track for you? Hangtown is two hours away. Track I grew up on. I got photos of me riding there when I was four years old. Does that put some pressure on? Like, I really got to perform there? I don’t think so. We’ll see. Sometimes I feel nervous, whole lot of pressure. Sometimes no nerves. I wasn’t nervous at all tonight.